Do you need a fun and interactive book for your little one? Are you trying to introduce books to a wriggler who won’t sit still? The Gruffalo Puppet Book might be just what you’re looking for. This fantastic board book is a beautiful and engaging version of the much-loved Gruffalo story. 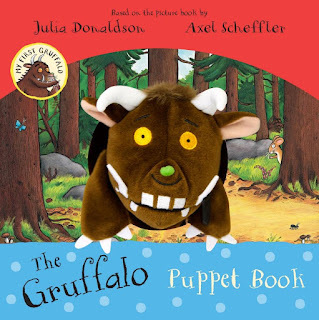 Recreated for a younger audience, the story is super condensed (less than 100 words), so it’s more of an introduction to the characters in the Gruffalo world rather than an actual story. The masterful Axel Scheffler has brought his illustrating magic back for this edition, so Gruffalo fans will feel like they’re sitting down with an old friend. If you’re new to the Gruffalo world, you will fall in love with the colours, depth and detail of the pictures. But what makes this board book so special is the Gruffalo puppet. It is well made, comes attached to the book and bursts from the centre of the pages, demanding (and getting) attention from the audience. Every Gruffalo feature has been included down to the Gruffalo’s black tongue and spiky purple prickles. Each page prompts interaction from the audience (can you scratch the Gruffalo’s nose?) or the puppeteer (can you wave the Gruffalo’s arms? ), making the book interactive and engaging for kids who may not be thrilled about staying still for a story. Tested on a one year old, this book was capable of holding attention and triggering a lunge for the puppet when the story was finished. This is a great book for introducing little ones to reading and story time. It is short, engaging, interactive and fun to read. You might also be interested in the other books in the My First Gruffalo Range, which includes touch and feel books and books about sounds, numbers and opposites.